This new design by Sumner Company Homes is sure to please! The ''Kahiltna'' is a spacious 4 bedroom, 2.5 bath home with 1916 Sqft. of living space. This home comes FULLY LOADED with a gas fireplace, farm sink in kitchen, gorgeous stacked rock fireplace, custom cabinets, tons of windows to let in natural light, granite countertops in the kitchen, and quartz in the bathrooms. The Master Suite...more This new design by Sumner Company Homes is sure to please! The "Kahiltna" is a spacious 4 bedroom, 2.5 bath home with 1916 Sqft. of living space. This home comes FULLY LOADED with a gas fireplace, farm sink in kitchen, gorgeous stacked rock fireplace, custom cabinets, tons of windows to let in natural light, granite countertops in the kitchen, and quartz in the bathrooms. The Master Suite features a lighted tray ceiling, double sinks, custom tiled shower, soaking tub, and a large walk in closet with custom organizers. This home is on OVER AN ACRE of land, features a 2 story family room and has a HUGE 3 car garage for all of your toys. 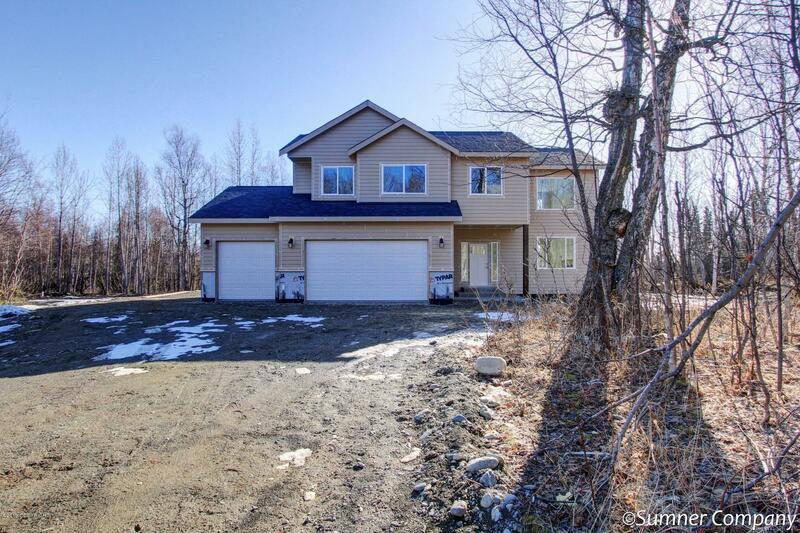 This home is in the perfect commute location for JBER or Anchorage commuters.